Launching a high-voltage campaign for the Lok Sabha elections, the BJP leadership, led by Prime Minister Atal Bihari Vajpayee, today made a blistering attack on the Congress and asked the party cadres to redouble the efforts to woo minorities. 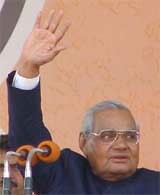 Atal Bihari Vajpayee waves to the gathering during the “Vijay Sankalp Rally” in the Capital on Friday. Although the Congress would like to forge an alliance with the Bahujan Samaj Party in Uttar Pradesh for the forthcoming Lok Sabha elections, the party is not depending on it. Janata Dal (S) president and former Prime Minister H.D. Deve Gowda said today that his party would contest all 28 Lok Sabha seats in Karnataka, but could leave “a few seats” to Left parties in the poll to the Karnataka Assembly. 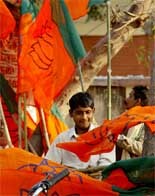 BJP workers carry party flags on the eve of an election campaign rally in Faizabad on Friday. A controversy has risen over the installation of Jyoti Basu’s statue at the Kolkata book fair as a national hero by the side of Rabindranath Tagore and Subhas Chandra Bose. The abducted two-and-a-half-year-old kin of Uttar Pradesh Chief Minister Mulayam Singh Yadav was rescued by the police from Bihar’s Siwan district. The National Commission for Minorities has decided to take up the issue of badly maintained gurdwaras in Bangladesh. Indian poultry is not threatened by bird flu and eggs and poultry meat are fit for human consumption, according to experts in animal husbandry and veterinary sciences. The Delhi High Court has said a “personal bias” of the Special Judge against Rajiv Gandhi was reflected in his order on the framing of charges in the Rs 64-crore Bofors payoff case. Deputy Prime Minister L K Advani said today that the government would soon initiate extradition of Mumbai blast accused Abu Salem from Portugal. Home Secretary N. Gopalaswamy and US Embassy Deputy Chief of Mission Robert Blake inaugurated an Economic and Computer Crime Investigators Conference at the American Center here today. India and Pakistan should evolve a protocol to avoid nuclear accidents and the proliferation of nuclear materials, former Chief of Army Staff Gen S. Padmanabhan (retd) said here yesterday. Purulia armsdrop convict Peter Bleach, who was released from jail two days ago following remission of his sentence, left for London this morning. Bleach, a British national, left the country at around 7:30 am by a British Airways flight, official sources said, adding a couple of officials from British Deputy High Commission accompanied 53-year old Bleach to the airport amidst tight security. The Supreme Court today issued notice to the Jammu and Kashmir Government on a petition alleging that the state was misusing the Public Safety Act to arrest people. The second “snan” (sacred bath) of the first Ardh Kumbh of the century was held on the occasion of Maghi Purnima here today. About one lakh pilgrims, mostly from western Uttar Pradesh, Haryana, Himachal Pradesh and Uttaranchal, took a dip in the Ganga at Har-ki-Pauri. Chelation therapy, an alternative to bypass surgery. Speaking at the party's National Council Meeting here, which was turned into a "Vijay Sankalp Adhiveshan", Mr Vajpayee held the Congress responsible for various ills afflicting the country, including the Kashmir issue, insurgency in the North-East, and the Sino-Indian border dispute. "Our government has made good progress in resolving these issues amicably. Still, a lot needs to be done. 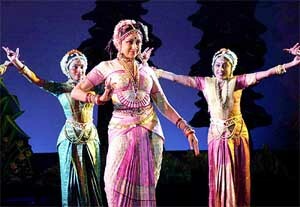 So I appeal to you (people) to give us one more tenure to resolve these issues for ever," Mr Vajpayee said. Stating that the successful governance of the NDA regime had dashed the "misconception" of the Congress that it alone could provide a stable government, Mr Vajpayee said: "The Congress, which used to ridicule coalition politics, is now running from pillar to post to forge alliances." Sounding a note of caution to the Opposition parties not to get into the "trap of Congress designs" to forge an alliance, Mr Vajpayee said: "The non-Congress friends open to such a coalition should ponder over the fact how they could have a coalition with a party that had been responsible for pulling down non-Congress coalition governments in the past." Asserting that the BJP never practised such politics, he said the party had gained the confidence of its partners and built up a successful coalition despite the divergent nature of supporting parties. Following the Prime Minister, Deputy Prime Minister L.K. Advani too lashed out at the Congress, saying the Congress's attitude in the Opposition had been "generally irresponsible and almost always negative". It was the BJP-led NDA government that had effected electoral reforms and also raised the issue of nuclear deterrence under the leadership of Mr Vajpayee, he said. Asserting that the feel-good factor was because of sustained improvement in the economy, Mr Advani said unlike the Congress, the BJP always shared the feel-good factor even with the Congress. He gave an example of the 1971 Indo-Pak war, saying Mr Vajpayee had appreciated the role of the then Prime Minister, Indira Gandhi. However, the Congress in the opposition had always played an irresponsible and negative role, he said. On the Ayodhya issue, Mr Advani said the Bharatiya Jana Sangh was the first to demand the resolution of the Ayodhya issue on the lines of the Somnath Temple. "But the Congress never paid heed to it for the sake of Muslim votes," he added. Setting the tone for the elections, BJP President M. Venkaiah Naidu asked the party cadres to seize the opportunity by bringing Muslims and Christians into the party fold to realise the 'Mission 2004' of winning 300 seats for the party and a two-thirds majority for the NDA. "Use the election campaign to draw in people who have traditionally kept out of politics. Draw in the youth, women, minorities, kisans, and the Dalits," Mr Naidu, who was formally elected as the BJP President for a full three-year term, said in his inaugural address. Striking a sarcastic note on the luncheon meeting of Opposition leaders hosted by Congress President Sonia Gandhi, Mr Naidu said the Opposition parties were a disparate lot and would not be able to come together. Although the Congress would like to forge an alliance with the Bahujan Samaj Party (BSP) in Uttar Pradesh for the forthcoming Lok Sabha elections, the party is not depending on it. Party strategists maintained they are simultaneously working on a contingency plan in case BSP chief Mayawati eventually decides not to ally with the Congress. Realising BSP supremo Mayawati’s unpredictable temperament, the Congress has taken a tactical decision not to withdraw support to the Samajwadi Party-led government in Uttar Pradesh. By doing so, it has kept open the possibility of negotiating with SP leader Mulayum Singh Yadav in case it is unable to do business with the BSP. If it is unable to have an understanding with Mr Mulayum Singh Yadav either, the Congress is also willing to go it alone. In that situation, it has decided to adopt a targetted approach and concentrate on seats where the Congress is on a strong wicket. Congress sources said the number of such winnable seats could range from 25 to 35, adding that the party is in the process of identifying these constituencies. Party insiders maintained that if they are left to fend for themselves, it will become imperative for Congress president Sonia Gandhi’s children, Rahul and Priyanka, to campaign in Uttar Pradesh in order to boost the party’s prospects. The Congress has long accepted that its support base in Uttar Pradesh has shrunk substantially over the years and that it needs an alliance partner to push up its numbers in this electorally- crucial state, which sends 80 MPs to the Lok Sabha. The Congress has, therefore, gone out of its way to woo Ms Mayawati as it believes a tie-up with the BSP can help it garner Dalit votes not just in Uttar Pradesh but also in other states like Madhya Pradesh, Punjab and Haryana. In fact, the Congress is even amenable to working out a seat-sharing package in the BSP for states outside UP. Although Ms Gandhi has personally taken the lead in contacting the BSP chief, Ms Mayawati has made no commitment. Just last week, two days afer the Congress president had dinner with her, Ms Mayawati called a special press conference to declare that she was yet to decide on having an alliance with any party. In the Congress party’s assessment, there is only a 30:70 chance of this alliance working out. Ever since she was emrbroiled in the Taj corridor case, the BJP is said to be working overtime in exploiting Ms Mayawati’s vulnerability. It is learnt that it is pressurising her to contest alone in Uttar Pradesh as a Congress-BSP alliance would tilt the balance against the BJP. Besides offering to go slow on her cases, the BJP is also learnt to have promised it will not field strong candidates in the BSP strongholds. It has even dangled the bait of placing UP under Central rule and an early assembly poll. If Ms Mayawati is proving to be unpredictable, the Congress finds Mr Mulayum Singh Yadav to be undependable. But given its compulsions in UP, the Congress would even be willing to do business with the SP. The Congress leadership is unlikely to ask Punjab Deputy Chief Minister Rajinder Kaur Bhattal to step down even after a Chandigarh court framed charges against her in a corruption case. Chief Minister Amarinder Singh and Ms Bhattal herself have publicly declared that there was no need for her to quit her post. Although there was no official word, senior Congress leaders privately endorsed this position, stating that Ms Bhattal’s guilt has yet to be proved. They also admitted the party could not afford to make any changes at this juncture when the Lok Sabha elections were less than two months away. Congress leaders said they were aware that the issue would be used against the party by its opponents, but expressed helplessness about it. Talking to reporters about the party’s national executive committee meeting, Mr Gowda said the party had decided against entering into any electoral alliance in Karnataka for the Lok Sabha poll. He, however, said the party was hopeful of fighting a few Lok Sabha seats in Kerala in alliance with the Left parties. The former Prime Minister said the coming poll was likely to throw up a hung Lok Sabha. The national executive, attended by 18 state unit presidents and senior functionaries, adopted a resolution criticising BJP’s economic policies. He said grievances of the poor would be the main poll issue of the JD (S) in the Lok Sabha poll. Mr Gowda said the party’s national executive had favoured a policy of electoral adjustment with progressive forces. The Marxist leader has been equated with Tagore and Netaji, which, though caused much uproar, has added special attention to millions of book-lovers visiting the fair since it was opened on January 29.
rare books on railways, Eastern Railway also opened a special counter at the stall to sell suburban tickets to book-lovers for their return home. A stall has been set up in the vicinity, jointly by Pather Panchali and the Vidyasagar Mela Committee, where a life-size statue of Jyoti Basu had been installed in the statue gallery of great men along with the Nobel laureate and Netaji, which has been causing much controversy. Pather Panchali and the Vidyasagar Mela Committee are headed by two CPM stalwarts, Mr Subhas Chakraborty, Sports and Transport Minister and Mr Biman Bose, politburo member and Left Front Chairman. Both leaders have publicly defended their decision to project Jyoti Basu as a great man along with Tagore and Netaji. A few years back, the then Kolkata police chief Tushar Talukdar raised a similar controversy by calling Jyoti Basu as a greatman of Bengal as Netaji. Jyoti Basu has not visited the book fair to see his statue. But Chief Minister Buddhadeb Bhattacherjee has been a daily visitor there. He, however, did not find the time to see Jyoti Basu in the great men’s stall. The abducted two-and-a-half-year-old kin of Uttar Pradesh Chief Minister Mulayam Singh Yadav was rescued by the police from Bihar’s Siwan district. The police also arrested the servant of the Chief Minister’s cousin for his alleged involvement in the incident. Nagendra, alias Shubham Yadav, grandson of the Chief Minister’s cousin Hakam Singh Yadav, who was kept in the house of Binda Sah at Rampur village, was rescued after a police party raided the place while acting on information given by the villagers, Superintendent of Police Jaglal Chowdhary said today. Pappu Sah, who had allegedly kidnapped Shubham from his residence under Kotwali police station in Etawah district of Uttar Pradesh on January 31, had kept the child under the care of his relatives Binda Sah and his family members. Pappu Sah was working as a servant at the house of Hakam Singh Yadav. The villagers found the boy crying last evening and informed the police which made the rescue possible. The police arrested Pappu Sah during the raid while efforts were on to nab Binda Sah who managed to escape. The National Commission for Minorities (NCM) has decided to take up the issue of badly maintained gurdwaras in Bangladesh. NCM Chairman Tarlochan Singh said here yesterday that he had written to the Ministry of External Affairs to organise a meeting between the Bangladesh High Commission and the Shiromani Gurdwara Parbandhak Committee (SGPC) to find a solution for the management of Sikh shrines there. He said they had got a positive response to their letter. At a meeting called by the Department of Animal Husbandry at Krishi Bhavan here on Tuesday, Punjab claimed that it was in total control of the situation and farmers in 3,000 poultry farms were following the necessary protocol to prevent the spread of the disease. Mr Bains further claimed that 3,000 veterinary doctors in Punjab were working round-the-clock. He said apprehensions about the bird flu spreading to human beings were totally unfounded. “This is not borne out by any scientific study. So, we don’t want people to be scared and give up eating meat and eggs. The Delhi High Court has said a “personal bias” of the Special Judge against Rajiv Gandhi was reflected in his order on the framing of charges in the Rs 64-crore Bofors payoff case. This was observed by Mr Justice J. D. Kapoor in his Wednesday’s order while dropping charges of bribing public servants against Europe-based Hinduja brothers. “Some of the glaring instances of such conclusions and observations that are self-contradictory and self-defeating, alleged by Hindujas’ lawyers Mr Jethmalani and Mr Kapil Sibal, are a result of personal bias of the judge against Rajiv Gandhi,” said Mr Justice Kapoor in his order. To substantiate his conclusion on this aspect, he reproduced at least nine paras of Special Judge Prem Kumar’s order relating to the statements of Rajiv Gandhi, the constitution of a Joint Parliamentary Committee, its findings and the diplomatic considerations. “By no standards do such conclusions or inferences and references drawn and made by the Special Judge without any material or evidence fall within the judicial domain,” he said. Mr Justice Kapoor, in his Bofors case judgement, has also severly criticised the media for running a “parallel trial” of the accused, saying that this affected the “stream of justice”. Also coming down heavily on the CBI for holding press conferences and accompanying mediapersons, including TV crew, during investigation of a crime, he said this needed to be stopped as it created risk of prejudice to the accused. Addressing party workers at the BJP National Council meeting here, Mr Advani said the Portuguese High Court had ordered the extradition of Abu Salem and the Indian Government was confident that the Supreme Court of Portugal would uphold the high court ruling. “I hope Abu Salem will be extradited to India in two months time,” Mr Advani said, adding that he was giving a maximum of two months for his extradition as Abu Salem could move the Portuguese Supreme Court against the high court order. However, there was no case in Portugal history that its apex court stayed of high court order, he added. Meanwhile, India has expressed appreciation for the Portuguese Government’s “excellent cooperation” in the Abu Salem extradition case. “The Government of India considers this positive decision as vital not only for India’s national security interests but also in the context of the global fight against terrorism. We are awaiting further development in this regard,” the Ministery of External Affairs said in a statement here. The conference is one of a series underscoring Indo-US cooperation in counter-terrorism, combating international crime, and responses to chemical-biological threats, under the auspices of the US Department of State’s Diplomatic Security Service, the US Embassy said today. Apart from the US Diplomatic Security Service, the US Secret Service, the US Customs Service and American Express India are participating in the conference, besides personnel from the Indian law enforcement community. With his indication to the recent disclosures of Dr Abdul Qadeer Khan, architect of Pakistan’s nuclear programme, of his involvement in nuclear proliferation, General Padmanabhan said: “This was one of the biggest worries”. He was speaking here after the release of his book, “Writing on the Wall-India Checkmates America 2017”. He said in the present scenario Pakistan’s neighbours could not sleep peacefully. 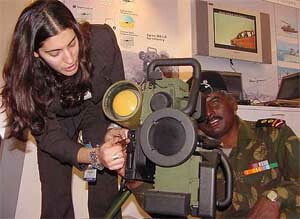 The book was released by Defence Minister George Fernandes. The General added that India and Pakistan must evolve a complete protocol to avoid nuclear accidents, including stealing of nuclear materials and proliferation attempts. He asserted that a nuclear weapon was “best kept in a basement if it must exist”. Purulia armsdrop convict Peter Bleach, who was released from jail two days ago following remission of his sentence, left for London this morning. Bleach, a British national, left the country at around 7:30 am by a British Airways flight, official sources said, adding a couple of officials from British Deputy High Commission accompanied 53-year old Bleach to the airport amidst tight security. Bleach did not make any comment before departure. The sources said his flight was delayed by about 40 minutes. Bleach spent more than eight years in jail following his arrest at a Mumbai airport a few days after a huge cache of arms was dropped over four villages of Purulia district of West Bengal in December 1995. He was released from Alipore Central Jail last Wednesday after President A.P.J. Abdul Kalam remitted the remainder of his life sentence following a request from the British government. A Bench comprising Mr Justice Doraiswamy Raju and Mr Justice Arijit Pasayat issued the notice on a petition by the State Legal Aid Committee (SLAC). The SLAC said one Farooq Ahmed, alias Bitta Karatey, was arrested by the state police under the Act for the second time and had been confined to jail altogether for 12 years. Panthers Party President and advocate Bhim Singh, appearing on behalf of the SLAC, also sought a direction to the Jammu and Kashmir DGP to pay compensation to Ahmed. Heavy security was deployed in the the mela area, including the PAC, ITBP, CISF, BSF, fire fighting force, the river police, bomb disposal squads and sniffer dogs. The mela officer, Mr Utpal Kumar Singh and the mela DIG, Mr P.K. Joshi, supervised the security arrangements. The “snan” passed off peacefully.